Put some parchment paper on a rimmed baking sheet for easy clean up. Put the first four ingredients in a bowl and toss with your hands. Add a little olive oil and toss again and continue doing so until all of the potatoes have oil on them but not too much. Put the potatoes on the baking sheet and spread them out in a single layer with space in between so the potatoes will roast and not steam. If you have too many potatoes, get out another baking sheet. 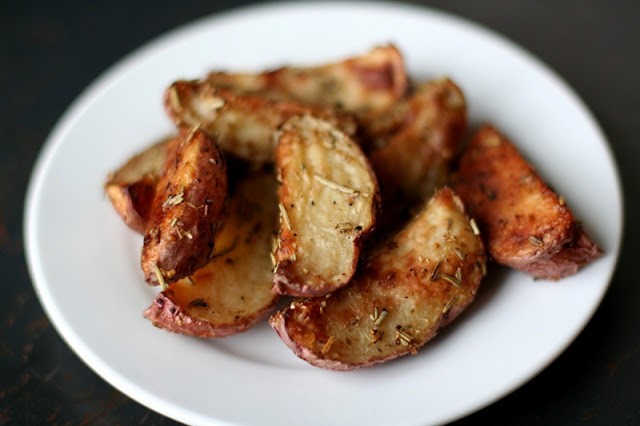 Place the baking sheet in the oven and roast for 45 minutes or until you see the potatoes have browned on the pan side and have a little browning on the rest of the sides. We will be featuring your recipe on our blog next week! :-) Feel free to check it out at www.addiekayphotography.com/blog! I can't wait to try the recipe for our family soon as well! Hi, Tosha! This is great! I will tell Willie - he is my husband and came up with the recipe and I photographed it for him. It's actually my favorite photograph and it's one of his favorite recipes so it's nice that you like it too! Trying these potatoes tonight with dinner. I love my potatoes and I love finding new ways to have them. Thank you for sharing. Thank you so much! I will pass this comment along to him!